Uganda can now output 27,000 barrels of oil per day. Since the confirmation of huge oil deposits in mid-western Uganda, the country is bracing for better economic prospects. A lot of foreign exchange is expected in the country, and many Ugandans are hoping it will better their living standards. But while the government has promised oil production will begin in 2009, the real work depends on the oil companies that will produce the oil. Heritage Oil Corporation, which has been doing oil exploration in Uganda since 1997 is one such company that Ugandans are looking forward to. Heritage Oil Corporation is a Canadian-based independent, international oil and gas exploration, development and production company. The Company has exploration projects in the Republic of Uganda and the Democratic Republic of Congo, a producing property in the Sultanate of Oman, and a development property in Russia and is pursuing oil producing opportunities in the Kurdistan region of Iraq. According to Heritage Oil, the company's producing, development and exploration projects, together with potential opportunities, provide a combination of early cash flow and longer-term value creation opportunities. Heritage Oil Corporation shares trade on The Toronto Stock Exchange, or TSX, under the symbol HOC. Though the existence of oil in mid western Uganda was confirmed in 1938 at WAK-1, effective interest in oil exploration did not materialize until 1997 when Heritage Oil was attracted to do seismic surveys in western Uganda. Heritage Oil and Gas Company (as it registered in Uganda) was the first company to start oil exploration in Uganda. The company's earlier efforts had been in the Semiliki region (Bundibugyo and Kasese districts), but they all turned out disappointing. When the company's management was almost pulling out, they were convinced to also try move their focus to Hoima, where huge oil deposits have been confirmed by Heritage and other prospecting companies since 2006. Heritage holds a 50% interest in Block 3A, which has an area of 1,991 square kilometers. Heritage is also operator of and holds a 50% interest in Block 1, which has an area of 4,285 square kilometers and is located to the north of Block 3A in the Albert Basin. Tullow Oil plc holds the other 50% interests in Blocks 3A and 1. The exploration licenses in Uganda, Blocks 3A and 1, are shown on the map above and table 1 below. The government's Petroleum Exploration and Production Department (PEPD) has split the Ugandan Albertine Rift oil-rich area into six exploration areas. Several of these have already been licensed to oil companies as shown below. Heritage Oil has the biggest oil find, following their confirmation early this year of world class oil at kingfisher well. Heritage Oils successfully tested four intervals at the Kingfisher well, resulting in an overall cumulative maximum flow rate of 13,893 bopd through a one-inch choke. Heritage Oil Corporation on Thursday announced final results from the successful testing of all three intervals in the deeper horizon of the Kingfisher-1A well in Block 3A, Uganda. The three intervals tested, from between 2,260m to 2,367m, had a total net productive thickness of 44 meters and produced at a cumulative maximum flow rate of 9,773 bopd. Additionally, the test of the shallower interval reported in November 2006 produced at a rate of 4,120 bopd, resulting in an overall cumulative maximum flow rate of 13,893 bopd from the Kingfisher well. "The cumulative flow rate of 13,893 bopd from the Kingfisher well has superseded our expectations. The test results indicate the outstanding potential of the Kingfisher discovery. It substantially lowers the exploration risk of drilling other multiple licenses, and it is also a step closer to future production and commercial viability. This is very exciting for Heritage as the licenses could transport the company," says Tony Buckingham, the Chief Executive Officer of Heritage Oil and Gas. 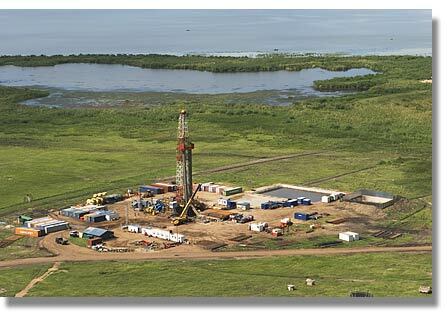 According to the company's latest report on oil exploration in Uganda, three intervals were successfully tested in February 2007, from between 2,260m to 2,367m and produced a cumulative maximum flow rate of 9,773 bopd over a total net productive thickness of 44 metres. "The oil is good quality light (between 30 and 32 API) and sweet with a low gas-oil ratio and some associated wax. The reservoirs are sandstones which have high permeability up to 2,300 milliDarcies," Heritage says. The report says the flow data indicated that when equipped for production, the well should be capable of flowing at stable rates of approximately 5,600 bopd. "The Albert Basin now looks increasingly like it has the elements to make it a world-class petroleum basin. The flow rates, even constrained by available completion and test facilities, far exceeded our expectations," Tony Buckingham says. The Country Manager of Heritage Oil & Gas, Brian Westwood says Uganda and his company are very lucky for the oil find in the country as it will generate much needed finances to develop the country and give Heritage adequate return on their investment. Heritage Oil and Gas in early May 2007 organised a function to thank God for blessing Uganda with oil. Westwood says that from the flow tests on Heritage's two wells (Kingfisher-1 and Kingfisher-1A), the company can now produce 14,000 barrels of oil per day. In total, when the discoveries of Heritage and Tullow Oil are combined, Uganda can now output 27,000 barrels of oil per day. Tullow Oil, a UK based Oil Company (formerly partnering with Hardman Resources), has discovered three wells with a total flow rate of 12,050 bpd. Heritage has contracted (with the government of Uganda) to acquire two seismic surveys this year; a 325 sq km 3D program over the Kingfisher and Pelican structures in Block 3A and a circa 500 km 2D survey in Block 1. The company will commence further drilling of the Kingfisher prospect following the acquisition and interpretation of the 3D seismic survey. "Efforts are currently being made to identify and secure a higher capacity rig capable of deeper drilling in order to explore the deepest objectives not penetrated by the Kingfisher well. In addition, initial plans are being developed to drill the offshore Pelican prospect next year," Heritage Oil says in its May 2007 report. Heritage has so excited Uganda's President Museveni that he has approved the company to go ahead and prepare to commit to oil production. The company is expected to get to the 3rd and 4th licensing stages (shown in table 2) and has already signed a Production Sharing Agreement (PSA) with the government. According to the draft Oil and Gas Policy for Uganda, the PSA (which the government has refused to disclose) stipulates a variety of license specific in terms, which have been discussed and agreed upon as part of the contract. PSAs show how the oil exploration and production will be paid for and how profits will be shared between the company, government and local authorities. These prospects have led to the acceleration of the company's 2007 work program and the shooting of two seismic surveys has commenced; a 325 square kilometer 3D program over the Kingfisher and Pelican structures in Block 3A and a 500 kilometer 2D survey in Block 1. Heritage is looking to drill another well on the Kingfisher prospect later this year to target the primary objective which lies beneath the approximate 3,200 meters reached in the Kingfisher well. Drilling of the Pelican structure is expected to commence in 2008. According to the company's operational and financial report, the first months of this year have been very active for Heritage, with a significant oil discovery in Uganda, completion of testing of a significant oil and gas discovery in Oman and the commencement of a multi-well drilling program in the Zapadno Chumpasskoye field, Russia. "In addition, $165 million was raised by the issue of an 8% convertible bond (2007 bonds) and there was the redemption of existing bonds for $82.5 million. With a strong cash position of $93.4 million at March 31, 2007, including $19.8 million of restricted cash, which is held in escrow to finance the first three semi-annual interest payments on the 2007 bonds, Heritage is well positioned to finance 2007 programs which include drilling in Western Siberia, development of the West Bukha field in Oman, seismic programs and further drilling in Uganda and formalizing a Production Sharing Agreement (PSA) in the Kurdistan Region of Iraq," the report reads in part. Heritage drilling oil at Kingfisher. Westwood says they have budgeted US $500,000 for maintenance of roads in the oil areas in Buhaguzi county, Hoima district. "This is in addition to US $200,000 spent on the road to Mbegu camp in Kaiso Tonya (Buseruka sub-county)," he says. Apart from work and roads for the local community, Westwood says Heritage has provided 17 boreholes for safe drinking water in Makundo, Rwebisengo, Mbegu, Bugoma, Pakiba and Panyigoro. The area Member of Parliament, Tom Kyahurwenda Abwooli confirms that the oil company is engaged in several community support ventures, especially supporting local schools, heath centers and providing health services. Heritage staff provide HIV/AIDS awareness counseling at the company's health centre and through sponsoring a radio program on local FM stations. Westwood says that Heritage has also extended financial assistance to AIDS and war orphans over the years as part of its commitment to develop while supporting the local community. "These people are showing good social responsibility but we want the government to consider making public what they agreed upon. We want to know the period of cost recovery and the sustainability of the project thereafter," says Emmanuel Dombo, the Chairperson of the Natural Resources Committee of the Parliament of Uganda. The company is also supporting the "Save Rhino fund" as a well as sponsoring a study of a unique specie of Semliki chimpanzee. Heritage recently provided computers to the Uganda Wildlife Authority, as well as generators, scramble motorcycles, boreholes and 4X4 vehicles for movement of game wardens. "We are very aware of our social responsibilities and our projects are ongoing. We work very closely with the community and are fully aware of their needs," Westwood says. In July 2006, Heritage Oil signed a Production Sharing Agreement in the DRC for a 39.5% interest in Blocks I and II in the prospective Albert Basin. 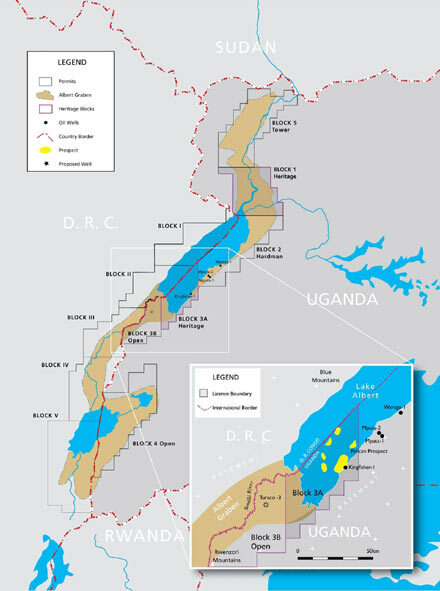 Blocks I and II cover over 6,000 km2 over the onshore and offshore acreage in the DRC part of the Albert Basin that extends into neighbouring Uganda. Heritage has established a jointly owned company, TISE HERITAGE NEFTEGAS, with TISE Holding Company to appraise and jointly acquire oil and gas opportunities in Russia and internationally. Heritage has a 95% interest in a development project in Russia, which has proven and probable reserves of 69 million barrels net to Heritage. Heritage has a 10% working interest in Block 8 in Oman. Block 8 includes Bukha, a producing gas-condensate field and West Bukha, an approved gas-condensate development. In the last quarter of 2006, the West Bukha-2 appraisal/development well test produced a combined flow-rate from the zones tested (Ilam/Mishrif/Mauddud and Thamama) of approximately 12,750 bopd and 26 MMscf/d. The oil was light (approximately 42 API). Development of the West Bukha field has commenced and comprises design, fabrication and installation of the wellhead platform and pipeline. Production is targeted for early 2008. The Company in 2006 commenced exploration in the Kurdistan region of Iraq. As of May 2007, Heritage was expecting discussions with the Ministry of Natural Resources of Kurdistan to be awarded Production Sharing Agreements (PSAs). Heritage has established a steering committee with the Ministry of Oil in Baghdad to undertake exclusive detailed field studies and to prepare development plans over a number of oil fields. 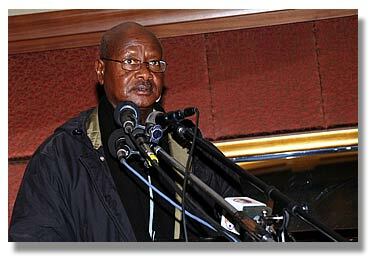 Also read: Oil Production in Uganda: Is the Nation Ready?